Holly Lauren is finally launched. 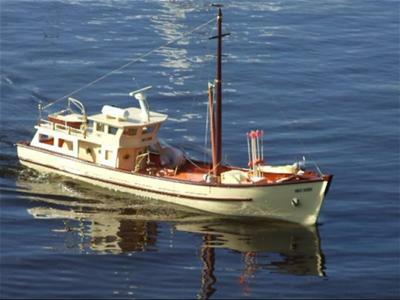 This is a 1.5 meter wooden trawler built without a plan from Tasmanian Huon Pine. I've done a bit of research into old Tasmanian boat builders, their boats and where they got their plans. It turned out that they built without a plan - it was all stored in their head and went to the grave with them. The old fishermen told me you could tell who built the boat by looking at the shape of the hull and certain features they built into the boat. They all had their own style of building, They decided on the length of the boat laid the keel and built their boat from there. So I decided if they could do that I should be able to do the same. I decided to use the dimensions of an 85 foot fishing boat that I maintained while working as a Diesel marine fitter. I am retired now. 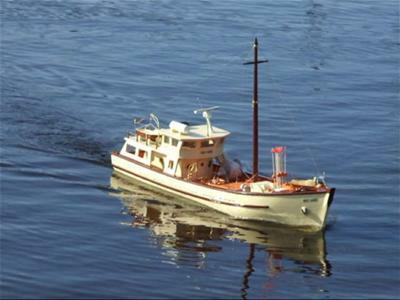 The model boat has taken about nine months to build. I powered the boat with an automotive fan motor from a Holden Commodore and the windscreen washer motor for water cooling of the motor. It is driving a 80mm four blade Raboesch propeller. The boat exceeded my expectations in the water it is very stable, quite fast at full throttle, and very maneuverable when docking. Over all I was very pleased with the results. I had a few electronics problems coming up with a ESC to operate a 13 pole DC Brushed motor. I tried several ESC and eventually used a Pro Boat ESC that Petter recommended when I first contacted him about what I would need to build the boat. I should of taken his advice and saved myself some electronics headaches. I hope the this information might help someone in their model boat building in the future. The motors are easy to find at any auto wrecker and quite cheap to buy. So have fun out there all you model boaters. 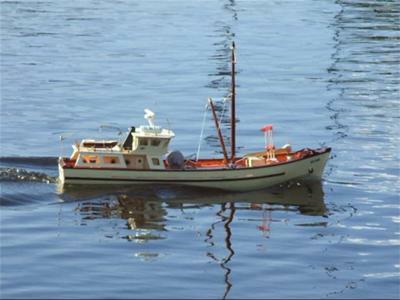 I launched the boat today and every thing went very well on the sea trials. It took on a bit of water around the hatch over the steering gear, so I need to modify that a bit. The official launch is coming up soon. I have a fibreglass hull that a friend gave me 1.2 meters in length on my work bench and enough electronics parts over from this build to make another boat. I am going well three granddaughters. They all want a boat named after them, so I am one and a half of the way there. I will keep in touch and let you know how this next boat comes up. Looks fantastic! 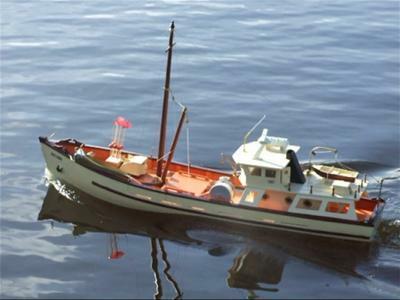 It looks truly realistic on the water. I'm so glad it all worked out for you in the end. It seems the motor provides a perfect pace for that size and type of hull. I'm always a little anxious recommending equipment to people, being human, I'm always paranoid of giving poor advice. Your success is a big boost to my confidence that the motor sizing method I describe works remarkably well. So, a big congrats for making it work. A masterfully executed achievement, no doubt. P.S. More pictures of Gilbert's RC Fishing Boat if you follow the link.